Can you name that fabric? 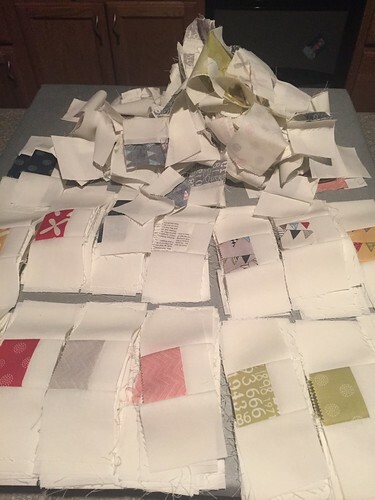 I dug this out when I saw that Amanda of The Linen Fox announced on Instagram that she’s going to be doing an QAL of The Inside Out/Plus quilt (Cluck Cluck Sew). This project has been in ‘archives’ for a few years… I cut a few years ago and then did nothing with. I thought it was completely cut and all I had to do was sew, but as I’m sewing and sewing and sewing, I’ve discovered that I have to cut a lot more of my background fabric. I was very happy to see that I had some of the background fabric in my stash so at least I don’t have to worry about going to purchase more of that. As you can see, I’m trying to get a little head start on the QAL. I’ve never once finished one on schedule….it is my best chance! I didn’t have to work on Monday, so I spent my day sewing – probably 4 hours worth. This is the Plus version of the pattern. I also have fabric to do the Inside Out version. For that version, I’m planning on using Lucy’s Crab Shack…that lets you know how long I’ve had these projects on my to-do list. The fabric is Reunion by Sweetwater. It’s Wednesday, so I’m linking up to Lee. Happy Hump Day, Y’all! This entry was posted in Quilts and tagged cluck cluck sew, freshly pieced, Inside Out Quilt, Lucy's Crab Shack, Plus Quilt, reunion, sweetwater, The Linen Fox, WIP. Bookmark the permalink. You crack me up! When is the deadline for this QAL? I think that there are many “signs” telling you to finish this quilt! No deadline announced yet! I’m so far ahead of the game this time!